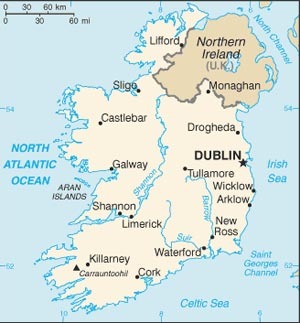 The beautiful island of Ireland lies to the West of continental Europe, on the Eastern fringes of the Atlantic Ocean. Just like it's near neighbour Scotland its history is steeped in Celtic origins. For example the Irish kilt is almost as well known as its Scottish cousin, and Irish and Scottish traditional folk music have many similarities, as does the Gaelic language which is spoken widely on both sides of the Irish Sea. It should be noted that although English is the official language of both countries, Gaelic is making a big comeback, on the island and in Scotland, and is now being taught widely in schools. The island is divided between North and South, with the North being a part of the United Kingdom, and the South being a Republic since 1921. Below you can see a map indicating the major towns and cities. The country has of course very strong links with North America, the famine in the early 1840s caused over one million people to emigrate to the United States. At that time half of all America's immigrants originated from the Emerald Isle, and today thirty five million Americans (over twelve percent of the population) claim Irish ancestry. Today though its a far different story, with their economy being one of the strongest in Europe, the country is now seeing an influx of immigrants flowing back to the island. A substantial number of these are Americans, who no doubt enjoy the high standard of living, which is now becoming the norm, and of course it takes them full circle, back to the land of their forefathers. And who wouldn't want to live in a country, where the people are renowned around the world for their friendliness and sense of humour. The scenery on the island is also breathtaking, as the film industry has been quick to realise, most of the outdoor scenes for Braveheart were actually shot in Ireland (I understand there were big financial incentives, to attract the industry, and why not). 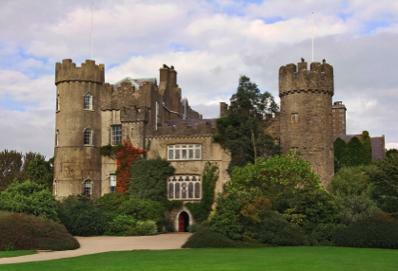 Ireland also has a wonderful array of Castles and Stately Homes, such as Malahide Castle, seen below. Pipe bands are also a fairly common sight, although kilts are not worn by your average Irishman, to anywhere near the same extent as they are in Scotland. In fact I have heard it said that it is almost impossible to buy a kilt in Dublin. So the next time you are there, and looking to buy a kilt, please let me know how you get on.